Fall is here...holidays are not far off! The sun is still shining, but the leaves are beginning to turn which means it’s the perfect time for holiday photos. Don’t wait until it’s too late for cards and gifts in December. 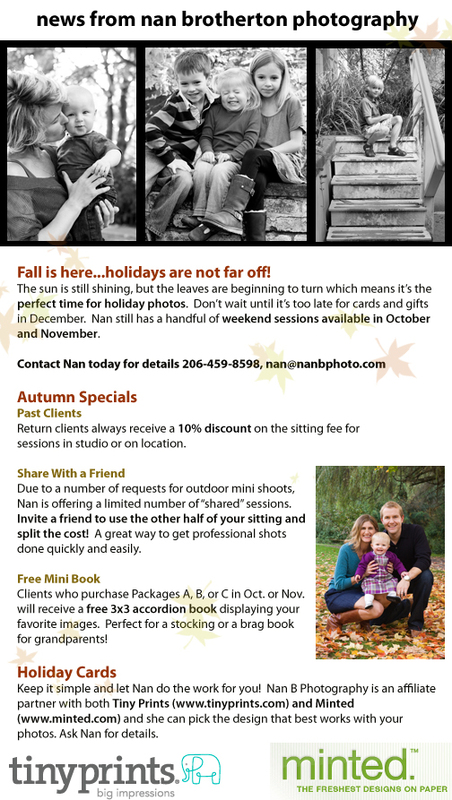 Nan still has a handful of weekend sessions available in October and November. sessions in studio or on location. Nan is offering a limited number of “shared” sessions. Clients who purchase Packages A, B, or C in Oct. or Nov.
Keep it simple and let Nan do the work for you! Nan B Photography is an affiliate partner with both Tiny Prints (www.tinyprints.com) and Minted (www.minted.com) and she can pick the design that best works with your photos. Ask Nan for details.